There are a lot of chocolate chip cookie recipes out there, and ever since I found David Lebovitz’ recipe for salted butter choc chip cookies, I haven’t poked my head back into the chocolate chip cookie recipe jungle. Until this particular recipe, that is. It’s from The Violet Bakery Cookbook which I mentioned in the butterscotch blondies post from a while back (and which is, so far, hands down my favourite baking book to date, even though I’ve only tried out five of the recipes yet, 1) because they’ve all been easy, and 2) because the results have all been a kind of original take on a familiar favourite, kind of like your favourite old recipe but better, somehow). The idea of using only egg yolks intrigued me, and since I’d just made a batch of coconut macaroons and had a bunch of leftover egg yolks, well… the cookie fates were kind of forcing my hand here. Moreover, it takes all of ten minutes to whip up. Big bonus in my book, and ideal for 10pm/post coconut macaroon baking-cookie baking. 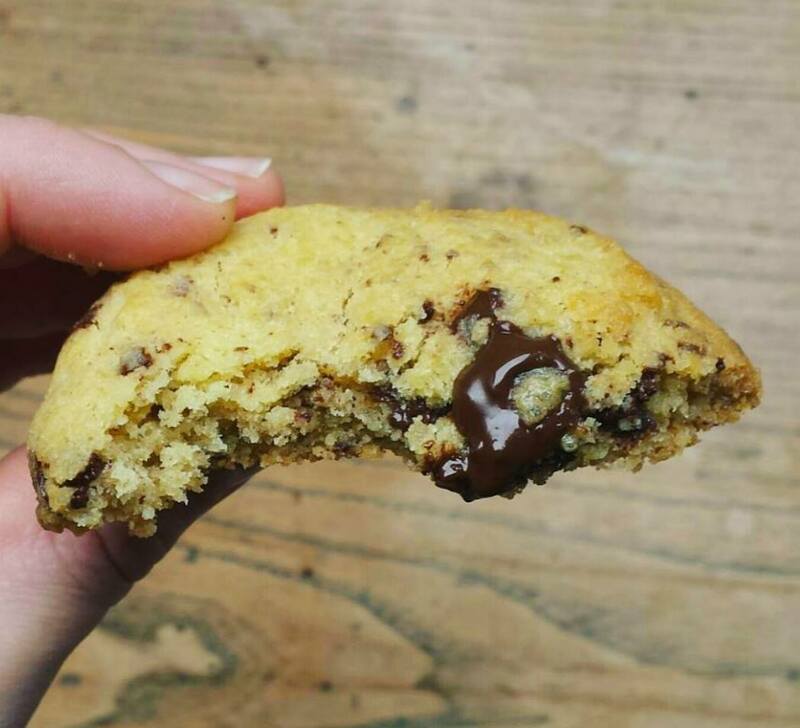 So even if you’re not in the market for a new chocolate chip cookie recipe I highly recommend giving this one a try, because it’s just that bit different to other cookies, and much, much easier to make. Clair recommends freezing the cookies before baking, but I found that it didn’t make any difference, and that the cookies still came out thick and chewy and beautifully even. Much prettier than any other cookie I’ve made, in fact. So hop to it 🙂 you won’t regret it. Preheat your oven to 180°C/360°F. Line two baking sheets with baking parchment. In a large bowl, combine the butter and sugar. A wooden spoon will do nicely for this if your butter is softened enough, no need for an electric whisk. (If it’s a tad on the fridge-hard side, microwave it in ten second increments until it’s more malleable, and then add the sugar). Stir in the vanilla and egg yolks. Mix flour, salt and baking soda in a small bowl, then stir this mixture and the chocolate chips into the wet ingredients. Using an ice cream scoop or two spoons, scoop little mounds of dough onto your baking sheet, with ample space to allow for spreading (my baking sheets are quite small, so I put 8 scoops per baking sheet, rotating the sheets and baking the cookies in 3 batches, and freezing the remaining 4 scoops for later day cookie consumption*). Bake for about 10-12 minutes, rotating your baking sheet towards the end to allow for even baking, until the cookies are beginning to turn brown and crisp around the edges, but are still pale and soft in the middle. Let cool on the baking sheet for ten minutes before transferring to a cooling rack/cookie tin/tummy. *If baking from frozen, take the cookies out of the freezer for about 10 minutes before baking.